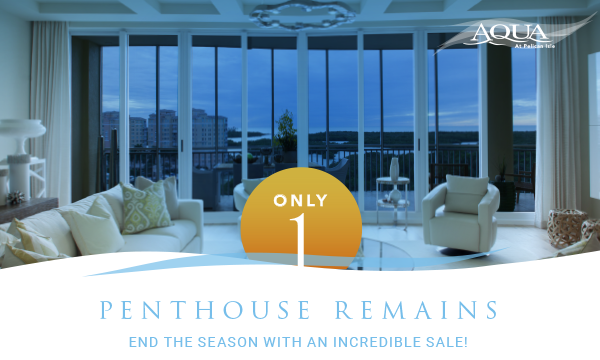 Show your clients the all-new 2017 furnished models and the penthouse before seasons ends! The penthouse is everything Naples was meant to be. If the spacious and well-appointed interiors don't sweep them off their feet, the grand terrace with outdoor wet bar, gas grill and stunning panoramic Gulf views surely will. Show them AQUA and they'll never want to leave. Each one of the AQUA's models was created by one of the region's leading design teams. Featuring open floor plans, elevated ceilings and stunning water and marina views (only 6 boat slips, 4 waterfront cabanas and 3 cottages remain), these models will please both first-time and returning visitors. Meticulously selected and pristinely maintained, AQUA's amenities give your elite clientele the resort experience they expect from Naples living. - Complete fitness amenities including, golf simulator!